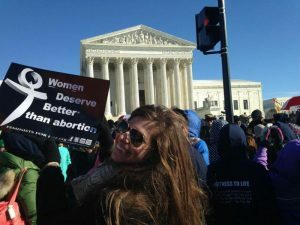 Then FFL intern (now law school student) Katherine Beck feels hopeful during the March for Life. It’s that time again when many choose to march at events across the country. FFL urgently needs volunteers to help us distribute placards, hold the banner, and march with us at the March for Life in Washington, D.C. on Friday, January 27. If you feel inspired to help us in D.C. or San Francisco to get out our messages that “Peace Begins in the Womb” and “Women Deserve Better than Abortion,” please email info@feministsforlife.org and send your full name and a cell number to use in case we need to text, call, or email volunteers during the event. Let us know which event you are attending. We will send you detailed information about meeting up when you let us know you’re volunteering! You are encouraged to download any of our posters and ads for free as long as they are unaltered and post them in your community year-round. And please like and share our messages on Facebook. If you can’t make it, cheer us on as you watch One Life LA, Walk for Life West Coast, and the March for Life (DC) on EWTN. You can also check out the nationwide list of March for Life events if you want to take part in your state. While many feel joy seeing old friends and allies at the various Marches across the United States in commemoration of the Roe v. Wade and Doe v. Bolton decisions, which eliminated legal protection for women and children through all nine months of pregnancy for any reason, we all know in our hearts that this is a solemn occasion — and one we hope some day we need not host.